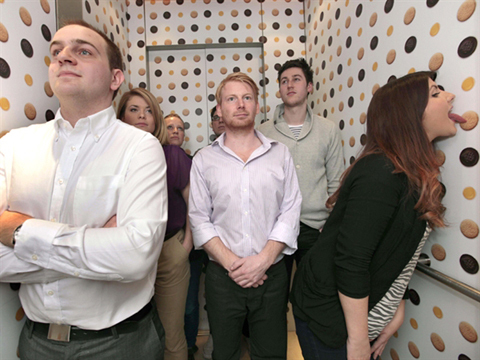 LICKABLE WALLPAPER… IN AN ELEVATOR?! Most people try to avoid touching escalator handrails or even the restroom door handle. But, employees at the London based communications firm Engine are much more daring! They recently had a lickable wallpaper which consists of 1,325 Jaffa Cakes installed in one of their elevators! Jaffa Cakes resemble cookies in appearance but have three layers which consists of a sponge base, orange flavored jelly and a chocolate coating. No need to worry about germs… a bellboy removes the stickers after a Jaffa Cake has been licked! This exciting project is a nonconventional way in which Engine hopes to help encourage stress relief.